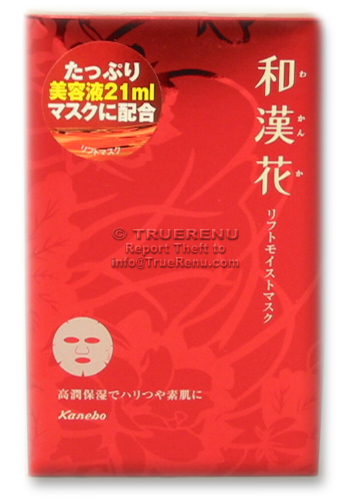 Use the Facial Lift Mask together with the Wakanka Wrinkle Jelly Pack (4095) around eyes and mouth. You condition your hair, so why shouldn't your face get the same kind of special care. A full 21 Ml of hydrating herbs give the face a lift and an extra dose of moisture, twice a week! For men and women. Lay one mask over cleansed and toned face. Leave it for 10 minutes, then remove. You can rinse your face if you wish, but you can also simply dab any excess mask liquid with a cotton pad and let your skin air dry. Ingredients: Water, dipropylene glycol, butylene glycol, glycerin, methyl gluceth-20, PEG-60 hydrogenated castor oil, carbomer, polysorborate 20, potassium hydroxide, xanthan gum, sodium polyacrylate, citric acid, alchohol, disodium edta, angelica acutiloba root extract, hydrogenated lecithin, averrhoa caramnola fruit extract, litchi chinensis seed extract, phenoxethanol, methylparaben.